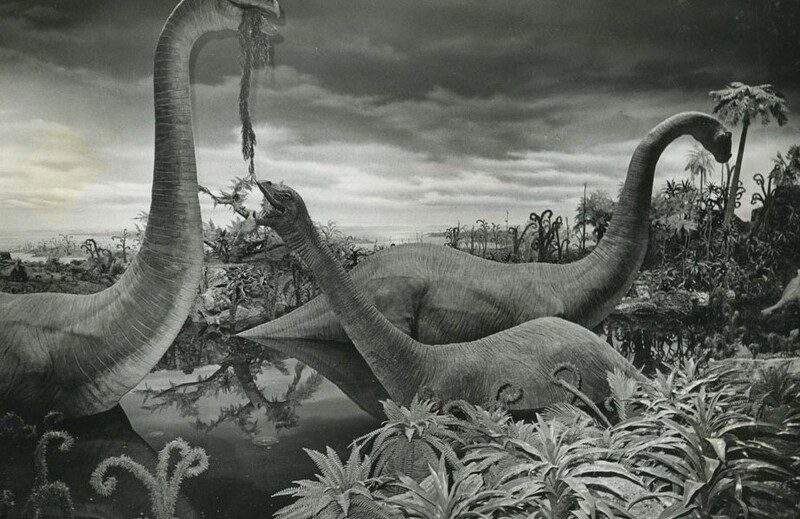 Primeval World Diorama on the Santa Fe and Disneyland Railroad, opening on July 1, 1966. The display used elements from the Ford Magic Skyway at the New York World’s Fair. Several varieties of prehistoric creatures are represented by Audio-Animatronics, set in a misty swamp. The brontosaurus snacks on greenery from the swamp while nearby a stegosaurus and a Tyrannosaurus Rex ready themselves for battle. The Ford pavilion at the Fair also included cavemen, but the humans did not make it to the Disneyland attraction. Also on the Western River Railroad at Tokyo Disneyland.